One of my favorite things happened in the kitchen this morning. I woke up to find ripened bananas hanging from my banana hook. 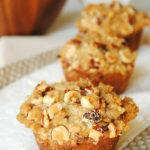 To me, it was a sight for sore eyes and I couldn’t wait to create a baked banana treat. My husband has been craving a chocolate treat for many days now so when I told him that I was going to bake with the bananas he was a little disappointed. Since I’m heading out of town for a few days this week, I knew I had to use up the bananas prior to my departure. 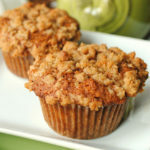 Because of this, I had to think of a way to spruce up my traditional muffins in order to keep the husband happy…and to give him treats to snack on throughout the week. I perused my cupboard and refrigerator to see what I could come up with using mashed bananas and discovered that I had just enough cream cheese for a delicious stuffing. 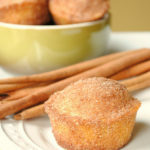 By adding just a tablespoonful of the cream cheese filling into each muffin cup, it resulted in a smooth and creamy dollop of a surprise in each and every bite of the muffins. Preheat oven to 375 degrees. Grease muffin cups or line with muffin liners. Combine 1 1/2 cups all-purpose flour, baking soda, baking powder and salt. In a separate bowl, mash the bananas and then beat together the bananas, sugar, egg, melted butter and vanilla extract. Combine banana mixture with the flour mixture until just moistened. 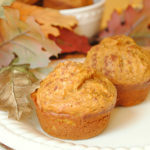 Spoon batter into prepared muffin cups (leave a little batter to top the cream cheese filling). Create the cream cheese filling by mixing together all three of the ingredients. 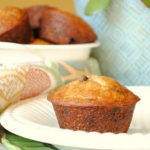 Pour a tablespoonful onto the batter in the muffin cups. Top the cream cheese with the remaining muffin batter. Create the topping: use a fork and mix together the brown sugar, 1/4 cup all-purpose flour, cinnamon and butter until crumbly. Sprinkle mixture over the batter. Bake for 18 to 20 minutes or until a toothpick inserted into the center comes out clean. Oh my gosh Jen, I was JUST looking for recipes to bake up some over-ripe bananas. Now I know what I'll be making!! I so just ate a bagel with homemade banana cream cheese, but I would have had one of these babies with my morning coffee! The cream cheese filling is a fantastic idea, Jen! What a treat this would be on a weekend morning. Wow, I don't think you could have had better timing! I was planning on making banana muffins tonight, and was attempting to figure out what to do with my leftover cream cheese. Perfection! One question: Is this recipe intended to make 12 or 24? These look so good. I'm going to make these this weekend! Oh wow. You had me at banana. I definitely could eat 4 of these if you sat them in front of me right now, delicious! These look delicious. Never thought of banana and cream cheese together for some reason. Hi! I just made these muffins and I was curious if I made the filling correctly. I imagined it would be a dollop of cream cheese but when I add the egg obviously it becomes very runny. Is this right? When I put it on top of the mixture it just runs over the mixture. Taste wise, its great. I'm curious if you think the egg in the cream cheese is necessary or could do without. I'm not an expert by any means. What a genius idea! 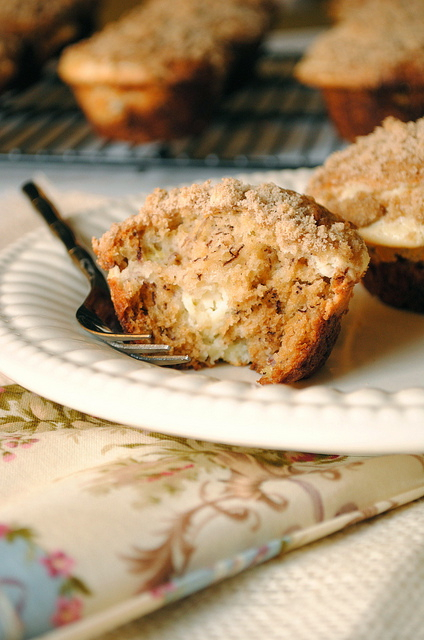 I would have never thought of a cream cheese filling for a muffin but it sounds glorious. I made those on Saturday. The thing is I put the cream cheese in the center but when I had a bite of the muffin the center did not have any. The cream cheese was baked. Did I do something wrong??? 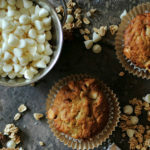 i made these the other day and they are some of my favorite muffins! thanks for sharing! I am having the same "runny" issue with the cream cheese. Tips? i just made them now. God, they are heavenly and im not a fan of banana, but i ate two straight ahead!! how many muffins does this recipe make? Just made these and they were amazing! They ended up with more of a thin layer of cream cheese then a filling but still sooo delicious! Once I mixed up the cream cheese filling and saw that it was pretty runny.. Filled up the cups of an ice cube tray with the mix and freeze em' Maybe 20 mins? They didn't come out as perfect cubes.. but I was able to scoop em' out with a fork and they worked perfect.